There are five levels in the Voice for Life scheme, for singers of any age from beginners through to advanced singers, starting with a preparatory level for new, inexperienced singers. The preparatory White Level for new singers (ie, probationers/trainee choir members) introduces and assesses very basic choral skills and understanding. On completion of this preparatory level, the singer is admitted as a full member of the choir. It is also custom to award a surplice at this stage. Once the singer has become a full member of the choir, they move on to the four main levels of Voice for Life: Light Blue, Dark Blue, Red and Yellow. At each level of Voice for Life there are graded targets which are assessed informally by the choir trainer or teacher. Once a singer has completed the necessary training for that level, reached the targets and finished their workbook they can be awarded their RSCM Voice for Life medal and the appropriately coloured ribbon. For all five levels, as well as for the Bronze, Silver and Gold awards, candidates are tested on singing skills, general musicianship and a growing knowledge of the context in which they sing, including liturgy, the church year, and musical history. 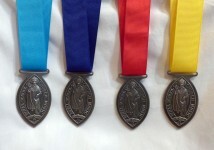 In order to support the choir trainer and affirm the levels achieved within the choir while working on the Voice for Life training scheme, the RSCM provides a parallel system of awards designed to be assessed through a formal external examination: these are called the Bronze, Silver and Gold awards. 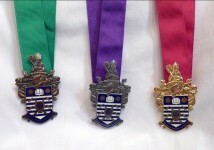 Successful candidates are entitled to wear a prestigious medal cast in the appropriately coloured metal (bronze, silver or gold) and these are worn on distinctive ribbons. Bronze awards are worn with a Green ribbon, Silver awards with a Purple ribbon and the Gold award with a Dark Red ribbon.